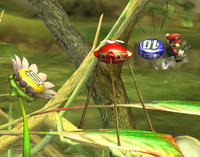 Pellets are Pikmin items found in Super Smash Bros. Brawl, Super Smash Bros. for Nintendo 3DS, and Super Smash Bros. Ultimate on the stage Distant Planet. They can be knocked off of Pellet Posies, picked up, and thrown at opponents to cause some damage. There are red, blue and yellow Pellets, with various numbers on them, although these factors make no difference to any damage they may deal. When thrown into an appearing Onion, they release items. GCN Pikmin 2 (8/2004) A crystallized nectar that contains the essence of the Pikmin's home world, these pellets are most often harvested from the plant life of the planet. Each pellet displays a number on its surface, and this number may increase over time. The Onion generates more Pikmin with bigger numbers. This page was last edited on December 29, 2018, at 14:31.